Do you want to learn Dutch quickly and thoroughly? If you work on the High Tech Campus in Eindhoven, you don't have to travel far to do so. Language Institute Regina Coeli provides Dutch language courses on campus. It’s easy to combine with your daily work, and there’s a course for every level. Of course you can also participate in our courses if you are not working on the High Tech Campus. Most expats are perfectly able to get by using English in the Netherlands. But you’ll feel much more at home here when you speak Dutch! Surely it’d be nicer to be able to understand things written in Dutch, follow a Dutch conversation and even participate in one? Maybe you already can and would like to improve your Dutch so you can have more complex conversations. Learn Dutch alongside your work by following a training course on the High Tech Campus. Due to the intensive nature of all our training courses, you’ll very quickly see results. Which training is best for you? Ask us for advice! We reserve the right to cancel the training no later than one week before the start in case of insufficient participation. 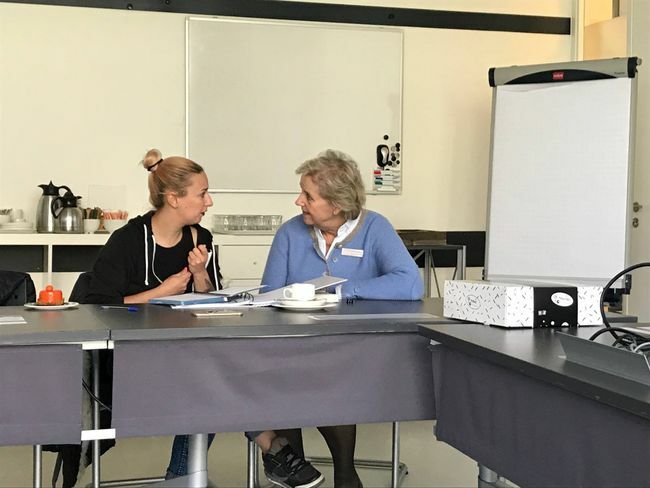 In this course, we focus on informal work conversations so that by the end, you will have enough knowledge of Dutch to have an informal chat with someone. The course consists of 9 group sessions in 3 weeks time. You can start this training without any prior knowledge of Dutch. The training course focuses on a final level of A1. Regina Coeli’s language courses are VAT exempt. If you have any questions about this course, please do not hesitate to contact us. Our Client Services department is available during office hours on 073 - 684 87 53. You can enroll for this course by completing the registration form. Do you already know a bit of Dutch, but perhaps not enough to be able to easily have an informal conversation? Then you can become even more skilful in Dutch during this training. The course consists of nine group lessons in three weeks’ time. You can start this training at an A1 level. The training course focuses on a final level of A1.2. You can easily conduct a conversation in Dutch from level A2. That is the objective of this course. To be able to take part in the training properly, you have an A1.2 level. For example, you have reached this level after completing the Intermediate Group Course Dutch 1. The training consists of twelve meetings spread over four weeks. You can start this training at an A1.1 level. The training course focuses on a final level of A2. In five weeks’ time, you work intensively with the Dutch language. From Monday to Thursday, you take a lesson at the beginning of the evening. The lessons consist of a blend of group and individual lessons. In addition, you also practise independently using Regina Coeli's e-learning program. Thanks to the condensed nature of the programme, you make great strides in your Dutch language skills. You can start this training at an A2 or B1 level. The fastest way to learn a language is by following an individual training course that has been fully tailored to your needs. And that is precisely our specialism. At our language institute in Vught, we almost never do otherwise, and this is also possible on the High Tech Campus. Simply contact us to discuss the options.